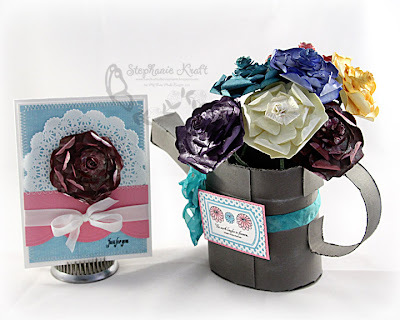 HandKrafted by Stephanie: MTME Sneak Peek Day 2 - Wonderful Watering Can! MTME Sneak Peek Day 2 - Wonderful Watering Can! Today is the second and final day of sneak peeks for the July My Time Made Easy © release! Lauren, Lesa, Pam and I are peeking the Wonderful Watering Can © template and Tending the Garden © stamp set. Dawn and Geny are showing off their fabulous card creations using Tending the Garden ©! When I think of watering cans, I think of rusty old vintage cans full of flowers! So that's exactly what I set out to create! I started by using my Cricut Expression and SCAL software to cut my watering can pieces out of Couture Gumshoe cardstock. Before I assembled it, I scuffed up the edges with an edge distresser and sponged some white ink over portions of it to give it that aged look (like it had sat outside for awhile). I added a piece of floral foam to the bottom of the can before I assembled it so that I could arrange my flowers inside of it. To make my wild roses, I used the Rambling Rose © cut file to create all of the layers (cut from Couture Santa's Beard). 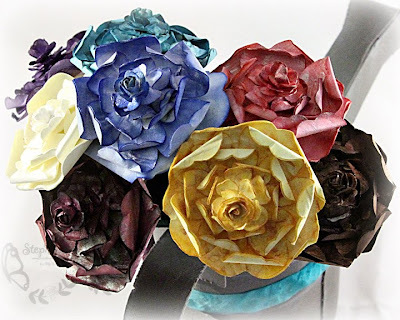 Note: I'd love to show you how easy these are to make; however, Lauren and Pam have both previously posted tutorials on how to make these roses, so I will refer you to their tutorials. Here's a link to Lauren's video tutorial, and here is Pam's photo tutorial. Finally, here's a closer look at the card that I made to go along with it. For my background paper, I used Sara's Bangin' Burlap (this will be released tomorrow along with many, many more digi papers). The sentiment, Just for You, is also from Tending the Garden ©. 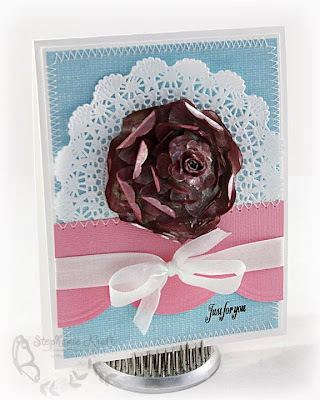 I saved one rose for my card and added it over a doily so it would be the main focus of my card. Thanks so much for stopping by! I will be back tomorrow (along with the rest of the team) for our big July release! Accessories: Wonderful Watering Can © template (MTME), Markers (Copic), Star Dust Stickles (Ranger), Seam binding ribbon, Foam tape, Thread, Sewing machine. Accessories: Rambling Rose © cut file (MTME), Glimmer Mist in assorted colors (Tattered Angels), Crimper, Bone folder, Tweezers, Mouse pad, Floral wire/tape, Dimensionals. Accessories: Embossed Curve border punch (EK Success), Doily (Sarah Martina Parker's Etsy store), Seam binding ribbon, Foam tape, Thread, Sewing machine. Such a pretty set Stephanie, I love those flowers, they are just gorgeous! Stunning flowers Stephanie! Love how you made the vintage watering can effect. Gorgeous work as always. What an incredibly sweet idea to make a vase of paper flowers with this template! OMword....this is stunning Stephanie! You did an amazing job!! Love those flowers!! Really great antique-looking flowering can! I love your flowers too. Simply amazing. I just love the colors. Lovely flowers and the watering can is so sweet! What a great project! Beautiful Stephanie! 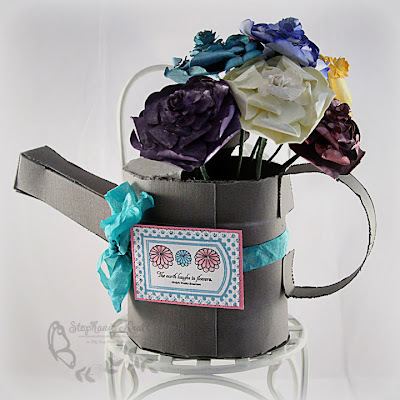 I love your bouquet of flowers inside the watering can...so pretty! 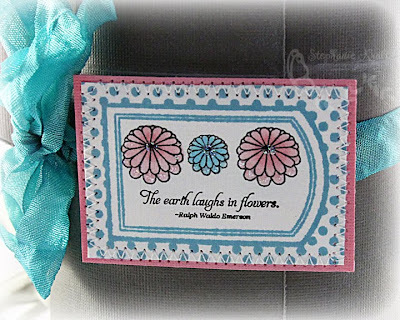 And what a great tip about putting the prima rose in the center -- smart thinkin' girl ;0). Beautifully done!! holy cow! This is AMAZING!!!! Love those flowers!!! Wow Stephanie! You were one busy girl! Love all those flowers you made - so pretty!